This is a one dish pork chop and rice dinner that is flavorful and super quick to put together. I love easy weeknight recipes, and this is one that you will make again and again. Directions - Preheat the oven to 350-degrees. In a medium skillet, melt the butter over medium-low heat. Add the rice and saute until it is light brown, about 5 minutes. Spread the rice in a 9X13 casserole dish, and sprinkle with parsley. Season the pork chops with the salt and pepper and add to the same skillet heat to medium high. Brown pork chops on each side (do not cook them all the way through). You just want them browned and seared on each side. Searing the pork chops first adds a nice rich flavor to the pork. Arrange the pork chops on top of the rice. Pour the broth and water over the chops. Spread the onion rings over the chops and cover the dish with aluminum foil and bake for 45 - 50 minutes, or until pork chops are tender and liquid has been absorbed in rice and rice is tender. Serve the pork chops on a bed of the rice. Yum, this is going to be tasty when finished cooking! If you want to kick your weeknight spaghetti dinner up a notch, this is the perfect recipe for you. This recipe has been all over Pinterest, so I thought I would give it a try. It is a new twist on an old family favorite, and I would guess it gets it's name because it is very "rich" dish. If you are counting calories you might want to skip this one, but it would be a great dish to take to a pot luck or serve to guests. Directions: Preheat oven to 350 degrees. Boil spaghetti noodles until al dente (med/firm). Drain and set aside noodles until ready to assemble. In medium bowl, combine the cream cheese, sour cream, cottage cheese, and parsley flakes util well blended. In skillet brown your ground beef and onion drain well. Combine the ground beef and spaghetti sauce with can of tomatoes and any spices you use to season your sauce. To assemble put a few slices of butter into your sprayed 9 x 13 inch pan (I actually used a 11 x 15 inch pan because I did not want it to bubble over in my oven). Place 1/2 of your cooked spaghetti noodles on top of butter slices. Place a few more slices of butter on top of noodles. Spread the cream cheese mixture on top of noodles in dish and place remaining noodles on top of the cheese mixture. Dot with remaining butter slices. Spread the top with sauce. Bake in 350 degree oven for about 30 minutes. Remove from oven and sprinkle with shredded cheese of your choice and place back in oven for about 15 minutes until cheese on top is melted. Let sit for a few minutes before serving. Great served with side salad and garlic bread! This is a delicious one dish Italian meal that is a combination of Lasagna and Spaghetti in one! Although spaghetti is not my Mother-In-Law Pat's favorite meal when we served it for dinner the other night she gave this recipe a 2 thumbs up! Give it a try... if you dare! 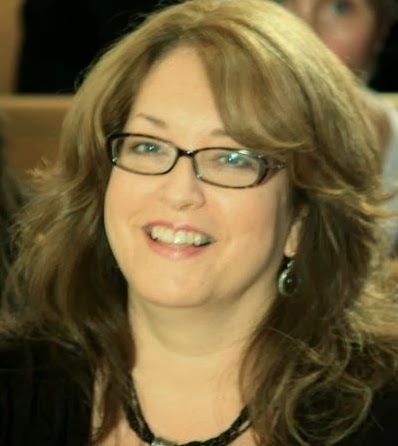 My kids were both busy on Mother's Day this year, Johnny was flying to Memphis for a film shoot for work last Sunday and Jes was working, so they both told be that we would celebrate this weekend. My Mother's Day request is the same every year, it's that we just do something fun as a family together. Since everyone is so busy with their own lives, it is fun to have a day to just spend time together. A few years ago we went to the Zoo together for Mother's Day. I had not been there in years and it was fun to just walk around and spend the day together. Today we went for lunch at Bibimbab which is a Korean restaurant in Novi. I have not eaten much Korean food and since Jessy's boyfriend is Korean/American who better to guide us through ordering! We had a fun lunch trying new food, and practicing with chop sticks. Towards the end of the meal we were all getting the hang of using the chopsticks efficiently but I still think the chop stick diet would be a great way to loose a few pounds ;)! John and I were not extremely creative and ordered one of the restaurants specialties called bibimbab which is a traditional Korean dish. It is a variety of vegetables on top of a bed of rice, baked in a traditional stone bowl topped with an egg and served with a special hot and spicy sauce. We had beef added to ours, but you could have the choice of beef, chicken, vegetable only, seafood, raw beef, or Albab. It was really delicious. 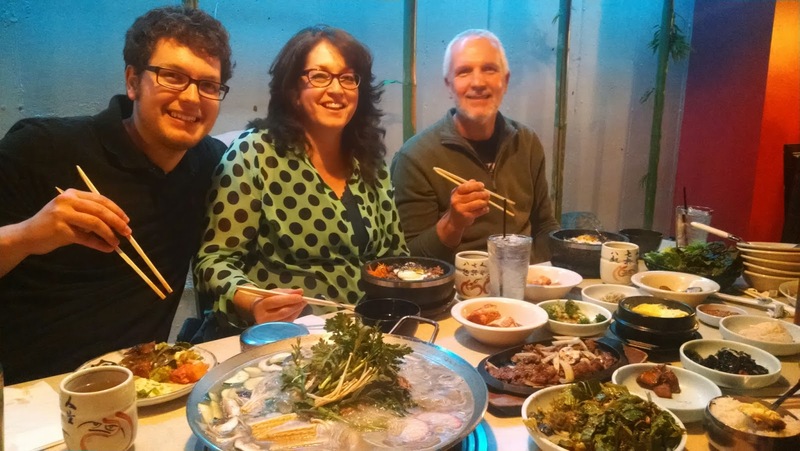 John, Jessy, and Justin ordered an appetizer that was called, Bul Ko Ki which was thinly sliced beef brisket in Korean bbq sauce. They brought with that Lettuce leaves, and Justin made us lettuce wraps with the meat, bean paste and something else I can't remember inside... they were really yummy. For their main course they ordered Bu Sut Bulkoki Jeongol, to share. It is hot pot type dish cooked right at your table. It was a soupy stew type dish with a variety of mushrooms, beef bulkoki, tofu, and assorted vegetables simmered in beef broth. With dinner they brought us an array of assorted authentic Korean side dishes in small bowls that included, cabbage Kimchi, radish Kimchi, seaweed, bean paste, small pieces of marinated potatoes, and a marinated broccoli. There were so many you could not even see the top of the table! It was super fun to taste them all... I said I felt like Andrew Zimmerman minus the grasshoppers ;)! 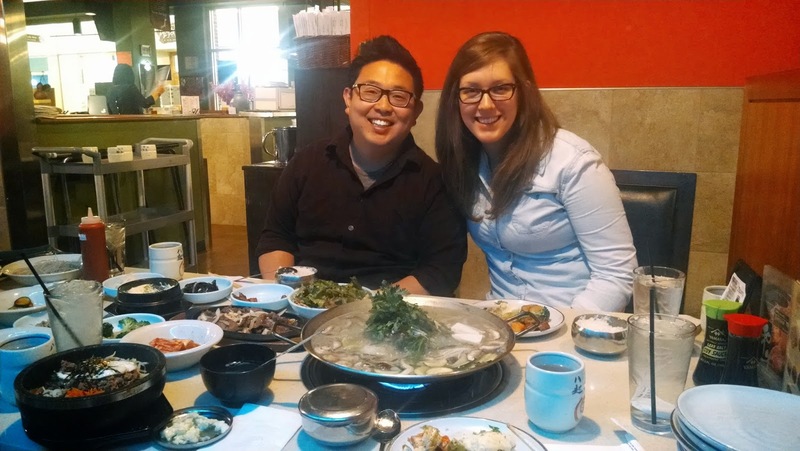 It was super cool that Justin could order for us in Korean, and then could explain all of the food! We had a great time, trying new things, and he was an extremely patient teacher :). After our lunch we all crammed into my little blue car and hit a few garage/estate sales. I really wish I had taken a picture of this, Johnny was joking that it was the "clown car" because we were all crammed in and piled out for a sale! They know it is something I enjoy and just wanted to hang out for a while. We did not find many treasures, other than a cordless drill for Justin which I proudly bartered the lady down from $20 to $15 bucks but is was a fun outing. The best Mother's Day gift is just spending time with my family. I hope you all had the opportunity to share some time with yours. I wish we had more days like this, but I do vaguely remember how it is when you are in your 20's! I have been spending more time helping out my Father lately who is 86 and have been looking for recipes that I know he will like and will be easy for me to re-heat for my family in the evening if I have a busy day with him. This is a hot hardy soup that is sure to stick to your ribs and has simple ingredients that everyone will love! I doubled the recipe because I wanted extra to take some to my Dad and send along with my guys for lunch at work this week. Directions: In large pan brown ground beef with vegetables until meat is tender, and veggies are soft. Drain fat from meat. Add minced garlic and dried herbs and stir. Add broth and bring to a boil. Add diced potatoes, reduce heat cover and cook until potatoes are tender about 10 to 12 minutes. In a small pan melt butter and add flour, cook and stir for 3 to 5 minutes until bubbly, Add to soup and bring to boil. Cook and stir for 2 minutes. Reduce heat to low. Stir in cheese, milk, salt, and pepper. Cook and continue to stir until cheese melts, do not boil! Remove from heat and stir in sour cream. Enjoy! Brown meat, and veggies until meat is cooked and veggies are tender. Stir in garlic, dried herbs and broth. add to soup and bring to a boil cooking for about 2 minutes. Reduce heat to low and add cheese and milk, stir until melted but do not boil! Remove from heat and add sour cream. As the weather gets warmer it is sure nice to take an afternoon break, sit on the porch and sip on a cool refreshing beverage! Starbucks Passion Tea Lemonade is a delicious treat and you don't even have to leave the house to enjoy it anymore. Yesterday was really hot and humid and I had been working in our basement sorting junk we have accumulate over the many years of raising a family and living in this house. We are getting ready for a garage sale and I have just been amazed at the stuff I have been able to just throw away. It was one of those sunny/stormy days and working in the basement was nice and cool, but when I came upstairs to take a little break I was shocked and how thick the air was. This Copycat Passion Tea Lemonade was just what I needed to refresh and get my second wind to finish my project! I hope you enjoy it as much as I did! Directions: Boil water (you can do it in the microwave if you want). Add the tea bags, sugar and vanilla and allow to steep for 15 minutes. Remove tea bags and refrigerate for an hour. 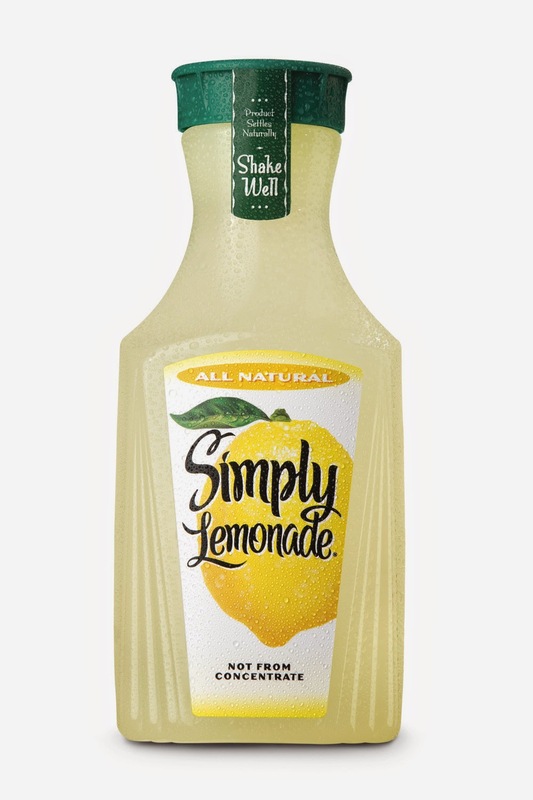 Add ice to a tall glass, add 1 part tea to two parts of Lemonade. 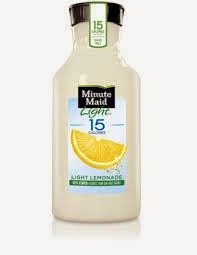 Cooks Notes: I usually use Simply Lemonade or Minutemade Light but I wanted a lower calorie version and I did not have either so I used Crystal Light lemonade and Splenda instead of sugar to sweeten the tea! It was light and refreshing! My lighter version of Passion Tea Lemonade! (or sweetener of choice) and vanilla. Let cool in fridge for 2 hours. Or make a pitcher full for a sunny afternoon on the porch! HAPPY MONDAY! Here is a great weekday recipe to help you get through a busy week! Crock pots are the absolute best for busy days and because I knew this week was going to be particularly busy I decided to make this one dish meal for my family. This happens to be a pretty economical meal and the ingredients are things you might even already have on hand. Directions: In skillet, lightly brown ground beef, drain well. Add garlic powder, salt and pepper, and I used a little Canadian steak seasoning, set aside. Place half the potatoes, half the onions, and 1/2 the mushrooms, in greased crock-pot. Add browned beef. Top with remaining potatoes, onions, and mushrooms. Combine mushroom soup and water, spread over top, being sure to moisten and cover evenly. Cover and cook on Low for 8 to 10 hours or on High for 3 to 4 hours. Serves 4 to 6. When you get home from work your mouth will water from the aroma! Serve with a green vegetable on the side for a quick easy meal! I made some yummy quartered brussel sprouts that I stir fried with a few pieces of bacon. It was super nice to have a hot hardy dinner just about done when getting home from a busy day! If you haven't used your crock pot in a while, get it out, blow off the dust and let it do the work for you!